Once again we are trapped by a week of rain. It softens the dirt and so we have trouble getting in the beds to plant, rock pick, weed, or really virtually anything else. We’ve been making up all sorts of jobs – we’ve seeded so much in the greenhouse that we’ve run out of rooms on the heat mats, I spent three hours yesterday cleaning and sweeping out Keith’s tractor shed, and we’ve weeded in the herb beds (which have sod pathways that we can walk through) for hours every day. I miss the sun. We used the Cut My Plastic to help build our greenhouse windows. We did get a little planting in this week. Our eggplant and summer squash are in the ground – just waiting for some love as we hoop them and cover them with row cover to prevent bug and deer damage. Our high tunnels are full of peppers and newly-transplanted rosemary, which demand astronomical amounts of water. Matt and I staked for a celeariac planting, but the thunderstorm has rain checked our plants. Another girl came to interview Tuesday – she had previously been in California for a few months with some forest and desert conversation projects, and she seemed like she could be a pretty solid fit. The green algae of death. The squash that Nate and I seeded over the weekend has germinated. It’s fun to go into the greenhouse and see them looking all happy and alive. 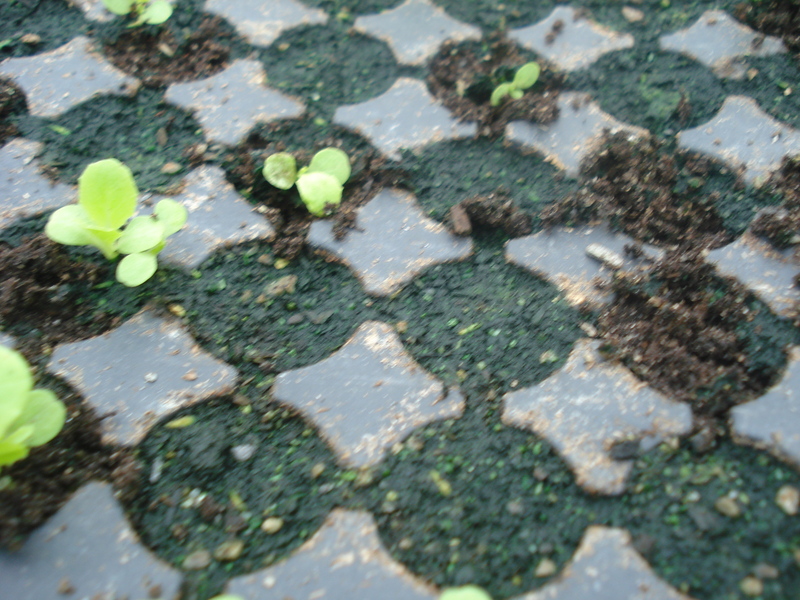 Especially as opposed to my recent ventures into the greenhouse, which have left me frustrated at myself. When watering, there are a whole number of factors one must take into consideration – the weather and temperature outside, the cell size of each tray of plants, etc. So I’ve been in charge of the greenhouse for a couple weeks now, and I’m still trying to figure all this out. This weekend was hot and dry, so I watered the plants a bunch. But I have been surface watering them a bunch instead of giving them a long drink a couple times, which is bad in prolonged overcast weather because this crusty algea-like green stuff forms over the tops of the dirt. It doesn’t kill the plant or anything, but it slows root development because the soil doesn’t aeroate so well. So I have been more than a couple hours sitting in the greenhouse during rain and before work officially started scraping the tops of trays to pull off this green stuff. No one is mad – it’s an inevitability in this weather – but I am trying to rectify it. But that has truly been my only low-ish point here. On the flipside, I have been getting better at remembering nuances of this job and helping with directions for some of the newer folks. As we finished seeding in the greenhouse yesterday, Casey remarked that it seems I have a knack for this, and that adrenaline rush carried me through the rest of the day. I know there’s still plenty of time for me to show my greenness, but I’m trying really hard to stay ahead of the curve. This includes trying out some farming extracurricular lessons. Matt is here for his third year and has learned the ropes of being an entrepreneur. He takes some of the garden space Keith creates for the workers and grows a couple things Keith doesn’t sell at market. Keith gets 25% of the profits and workers can only tend to those crops during off time, but it’s a chance to see how other things grow and grow some extra food for ourselves, so I got on board quick. 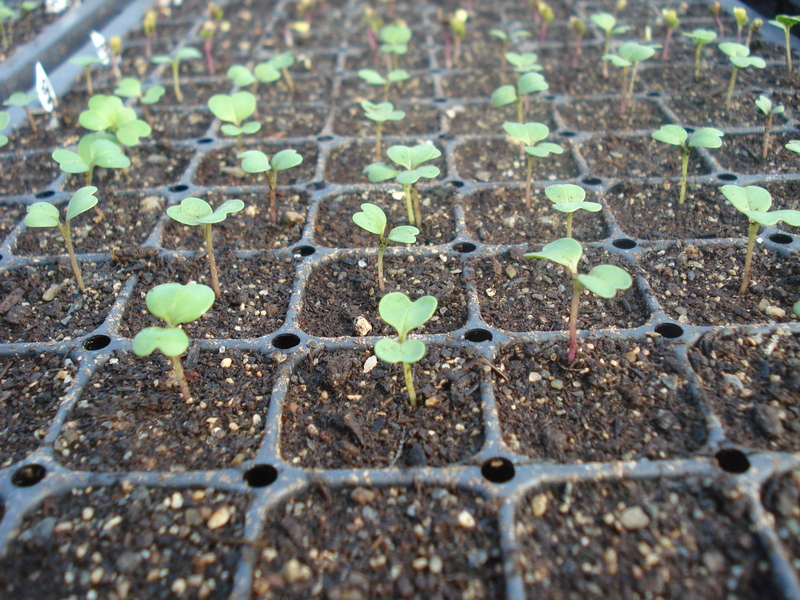 Broccoli raab (inspired by our Philly trip) is coming up strong, as are the Brussels sprouts and cauliflower. 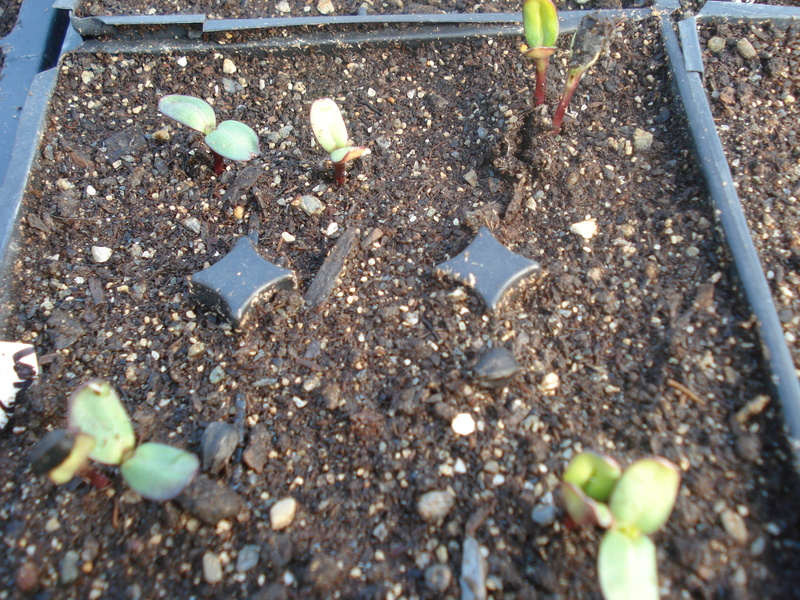 The delphiniums have a longer germination, but the nasturtiums just sprouted and the sunflowers look great. Tomatillos are up and husk cherries are in the works. And last night Matt wandered out in the damp fog and direct seeded some dill into one of the unused beds. Annnnd watermelons! It all means more work, but I’m just excited to learn. 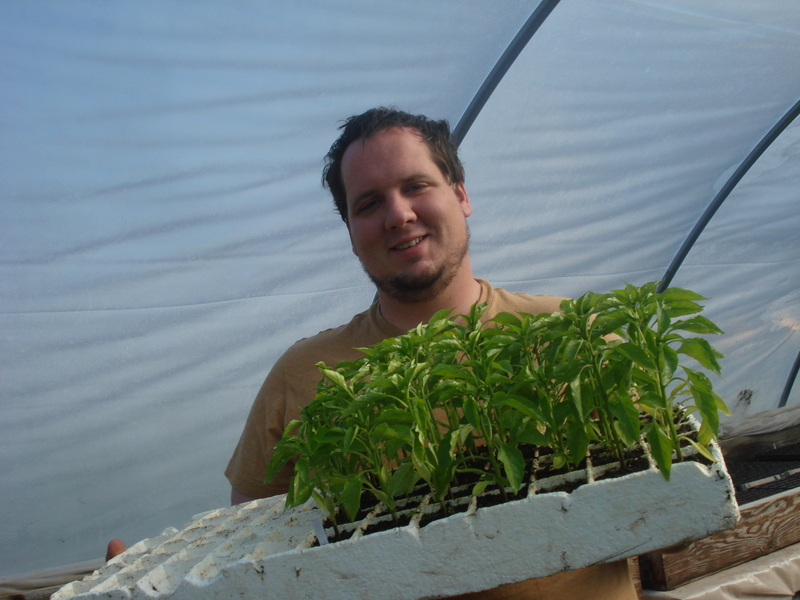 This entry was posted in Uncategorized and tagged farm intern, Organic Farming by wagnere1. Bookmark the permalink. Nice touch with the Farmer Nate photo!